studied classical archaeology and art history at Salzburg University. 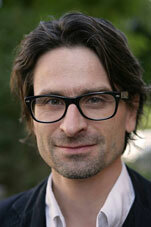 He has curated numerous exhibitions and since 2000 has been serving as director of State Gallery Linz. Since 2008, Martin Hochleitner has been professor of art history and art theory/curatorship focus at Kunstuniversität Linz. Before that, he taught at several universities, e.g. from 2007 to 2008 as visiting professor of photographic theory at University of Applied Arts Vienna. Martin Hochleitner lives in Linz.